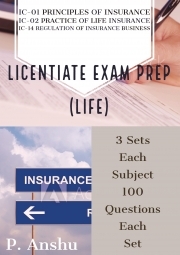 Description of "Licentiate (III) Exam Prep Workbook (Life)"
Licentiate Combo (III) Exam Prep (Life) This is developed according to latest syllabus outlined by Insurance Institute of India. Student can practice 7 days prior to their exam to evaluate their exam readiness. The questions were developed synchronised with latest exam pattern questions. Bhanu, a well-established corporate trainer and advisor at various training firms. He is also an independent consultant for two leading BFSI & soft skill training firms. As a panel trainer and guest faculty at various colleges and institutes, he demonstrates rich academic expertise in Banking, Financial Services & Insurance domain. He is well recognized in financial planning community for his deep academic & conceptual understanding on core subject. Reviews of "Licentiate (III) Exam Prep Workbook (Life)"